The box in all its American 2-2-0 glory. 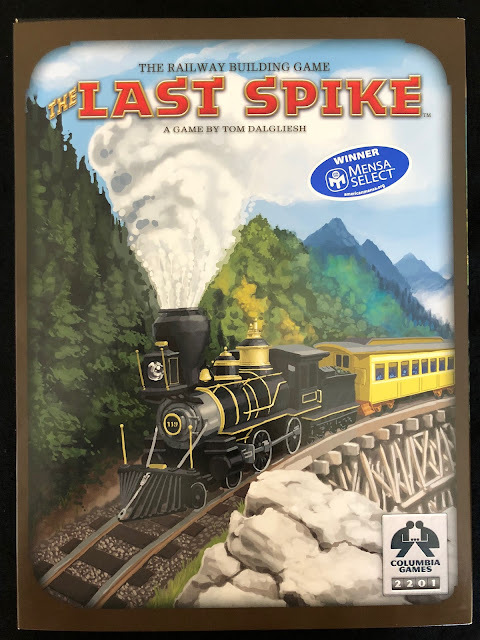 The Last Spike is a simple economic game that plays in about 45 minutes. That time is accurate for your first game and if every one at the table is familiar with the rules the game still plays in about 45 minutes... The rules are one of the simplest I have come across, almost as light as a party game which is a little strange coming from Columbia Games. This game serves as a very basic introduction to railway games, economic games or block games, take your pick, but you're not getting a comprehensive induction to either of those genres by playing this. However, don't think I didn't like it either, I did and it's in my 'games to take to game group bag' from now on; read on for my thoughts. I have had this game for months waiting for a review but every time I'd pull it down, or take it to a game group, it wouldn't get played because the box is not as attractive as games from a triple-A publisher like Asmodee, or FFG. The game, or at least my attempt to play it with both of my gaming groups, almost became a bit of a joke so I pounced on some unsuspecting house guests, neither of whom are/were gamers for my first play. Even my wife (Queen of the non-gamers, at least that's what it feels like to me!) played it and spoiler alert... everyone enjoyed it. My wife even went so far to say that although she thought she would hate it, primarily because of the drab brown box it came in, she would definitely play it again; that's a massive two thumbs up from me. My gaming group were reluctantly subjected to this game the week after, on my insistence, and we played with a full complement of 6 players, which the rule book advises is not the ideal number of players (3-5 being optimum) and no real slow down in play was noticed. Your turn consists of playing one of the four track tiles in your hand, buying a city card and refilling your hand of track tiles back up to four. 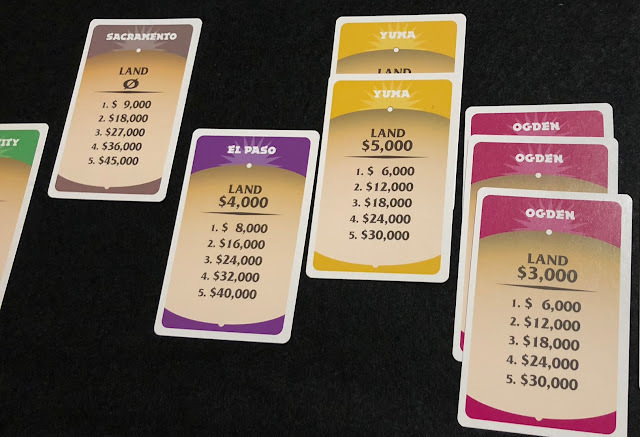 There are a few exceptions to this for example if a track connecting two cities is completed by your track, the city will pay out to every player who has bought the connected cities cards, i.e. invested in that city. The end of the game immediately happens when a continuous route from Saint Louis to Sacramento can be traced. This action will also bequeath a $20,000 bonus to the player who place the eponymous 'last spike'. Each track piece can only be placed in a specific spot, indicated by the coordinate on the tile and the matching coordinate on the board, e.g. B3 or Z1 etc. 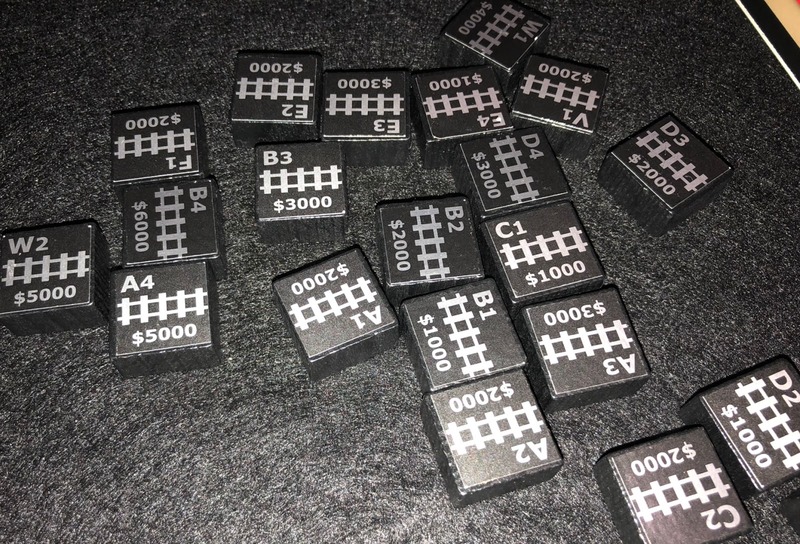 This allows you to play a little tactically by holding back pieces that you know your opponents are waiting for, although this does severely limit your own hand from 4 pieces to 3, and you have to balance your satisfaction from denying your opponents a big pay day, with limiting your own opportunities. I think the longest I've held onto some track, hoping to cause an opponents bankruptcy (it never happened) was about 6 turns. Talking of money, you start with $35,000 denoted by white red and blue wooden discs ($1, $5 and $10 respectively). Although I described this as an economic game it doesn't ever feel like you're going to run out after that first pay day. I have seen a player down to $4,000 as they had heavily invested in one city (not recommended by the rules) and it hadn't payed out in the early game. I would have like to see a slightly tighter economic game, especially at higher player counts - it never felt like money was an issue and by the end of the game every one is as rich as Croesus. The winner is simply the person with the most money, bearing in mind the $20,000 bonus for laying the last spike, at the end of the game. The end-game is where this game is best. During the early stages of the game it doesn't really feel like you're doing much as the board is relatively empty and your track lays don't feel like they have much consequence; other than looking to see which Cities are most likely to pay out earliest. However, the end-game feels very different; by then everyone has a firm grasp on all the rules (achieved by the second round) and is attempting to work out how to be the last player and getting the $20K bonus. This is largely down to the tile draw but delaying tactics can buy you some time and sometimes the game. Unfortunately that end-game tension does not have an early game comparison. The beginning of the game feels more like a full on cooperative game with no 'take that' present, yet in the last 10 minutes the game morphs into a hybrid between all working towards the same goal and doing their upmost to crown themselves winner, or denying others that chance. "Hunky Chunky ... Game Blocks"
Some would see the very simplistic game play as a negative but this game (in terms of game play alone) went over very well with my family, my pseudo-non-gaming-but-will-humour-him-if-necessary friends and my game group. The one resonant criticism that those groups all had was the components. 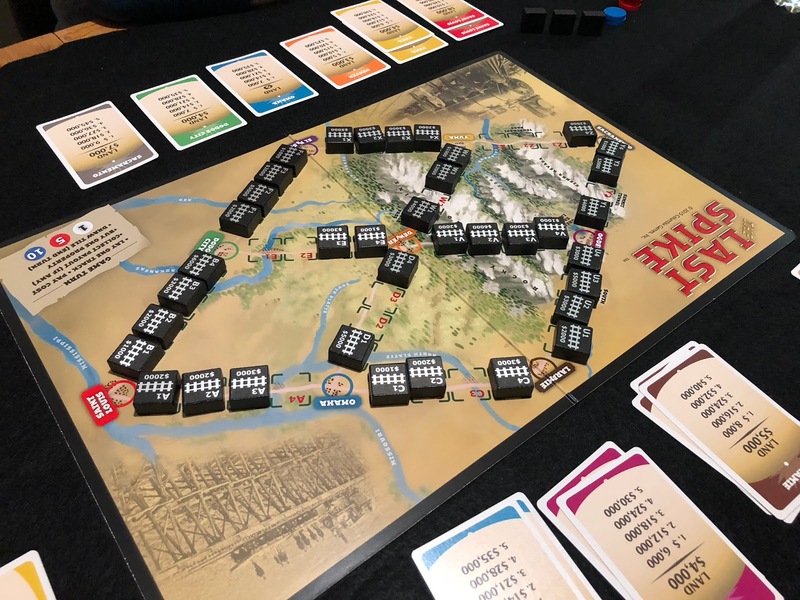 They criticised the board, the box and even the counters which I don't think is particularly fair, but it does highlight that I think this game would be most enjoyed by a non-gamer who will probably not be enticed by the aesthetic of this game. The tired-but-have-got-time-for-one-more-game type of gamer (I fit nicely into that category on game night), can easily overlook those criticisms and in fact would champion small publishers releasing interesting games that maybe don't have the production quality of the big hitters. The blocks are the familiar nice and chunky size of those in a block wargame and I have no issues with the stickers or cards. However, I'm not a fan of the money, although it does its job, unmarked denominations feels a but under-produced. The board and box are fine, nothing more, although maybe not what you would expect these days. 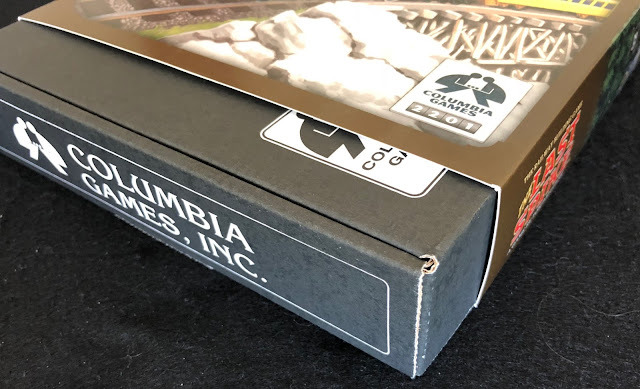 However, as a small publisher, I would rather Columbia Games continue to publish games with solid game play like this, than waste their money trying to match CMON's latest Kickstarter. 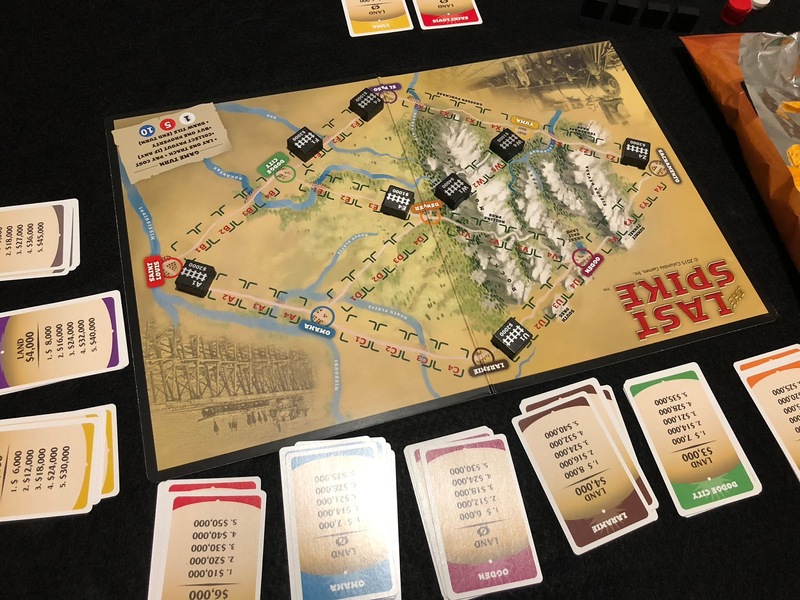 I was pleasantly surprised by this game, the game play is very easy to pickup, and is the perfect game to play either at a game group whist waiting for another table to finish up, or to introduce the very basics of train, economic or even block games to someone. There is variable game play, as you progress through the game it gets progressively meaner and there certainly are some interesting tactical decisions to be made later on. The components are a bit of a mixed bag, I really like the blocks, I didn't like the money discs, and everything else was perfectly fine. I would like to thank Columbia Games for sending this review copy of the game and also send my apologies for taking so long to convince my friends to play it... Somehow I don't think it'll take so long to get it back to the table now that they've tried it. You can still pick up a copy of this at many online retailers or direct from Columbia Games if you want to support a small independent board game publisher directly for $39.99 which I think is a very fair price for the amount of wood in the box. They also publish the rules on their website here.